In our garden state of almonds, grapes, rice, walnuts, figs, olives and so much more, the bees are starving. According to entomologists, the rising tendency toward monocultures, in which single-plant crops cover many contiguous acres, is limiting bees to a nutritionally deficient diet. The result is a weakened immune system, loss of reproductive capacity and decline in overall vigor of the species. "When you come to the reasons that bees are dying, like colony collapse, loss of habitat, stress, loss of genetic diversity and the use of pesticides—all of these things can be addressed to an extent by beekeeping in urbanized areas," says Serge Labesque, a beekeeping teacher at Santa Rosa Junior College. But many cities, like Santa Rosa and Napa, have safety ordinances against keeping bees, and the political climate is not entirely apiarian-friendly. Rob Keller, an artist and leading figure in the local beekeeping community, lives in Napa and keeps scores of hives around the North Bay. Keller has observed his rural bee colonies deteriorate, showing particular susceptibility to the problematic Varroa mite. For most of the past year, however, he stashed over a dozen hives in his Napa backyard. "Those colonies of mine were of great genetic material, and I had them here in the city to make it easy on them to get food and to keep their health up," he says. "They were getting a much more varied diet here." Keller's cherry tree, too, produced a bumper crop this year—strong testament to the beneficial work of bees—but following a neighbor's complaint, Keller was forced by the city to transfer the boxes to a friend's pear orchard south of town. "It's a monoculture out there," Keller says. "They have nothing to forage on. There are grapes, but grapes are self-pollinating." Hybridization between the European honeybee, the bee reared in hives around the world, and the African honeybee, introduced to South America in the 1950s, is another threat faced by honeybees today. Labesque believes that a large community of hobbyist beekeepers could serve as a barrier to hybridization between the two subspecies. Hobbyists, he explains, tend to pay closer attention to their hives than large-scale beekeepers, and when aggressive behavior in a colony is observed, beekeepers often respond by "requeening" the hive, or replacing the current female breeder with a fresh specimen and thereby resetting the genetic makeup of the colony. Feral populations, of course, receive no such treatment and may transform completely into the dangerously aggressive Africanized hybrid, which moved into the southern United States in the late 1990s. "But urban beekeepers tend to maintain a gentle, good-natured population of bees," Labesque assures. Helene Marshall, co-owner of Marshall's Farm Honey in American Canyon, says that cities can be just as unhealthy as farmland. "Gardeners use plenty of pesticides, too," she says. "It's not necessarily safer in the city than in the country." Katia Vincent, owner of the Beekind store in Sebastopol, disagrees. She points to city parks, where eucalyptus trees in particular may offer a wealth of seasonal blossoms, all high out of range of municipal pesticide application. Moreover, urban gardens are well-watered most of the year, keeping the nectar flow of the blossoms moving. In the feral rangeland, the current drought has curtailed nectar production in many wildflowers, Vincent says, and bees may be hard-pressed this summer to gather sufficient food for the winter. The city of Napa, which has never recorded a serious bee-sting case, prohibits bees on properties of less than one acre in size and requires that legal hives be kept at least 40 feet from neighbors' homes. In short, having legal hives in Napa is scarcely possible and most local beekeepers are no more than a phone call away from being shut down. Sonoma, Petaluma and Sebastopol are more accommodating toward bees, says Labesque. His hometown of Glen Ellen, too, is a relatively bee-friendly place, but the monotony of the surrounding grape-grown land constitutes a nutritional desert. Biodynamic and organic vineyards often provide cover crops and bee-friendly habitat among the rows, but most vineyards are barren. California's largest monoculture occurs in the Central Valley, where most of the state's 650,000 acres of almonds grow. These vast groves are simply too much for California's resident bees alone, which occupy an estimated half-million commercial hives. To mitigate this deficiency, almond growers bring in hives from as far away Australia and place the boxes among the trees at a density of three per acre. Such intermingling of bees from around the world has encouraged the spread of disease, says Kathy Kellison, who believes one of the answers to alleviating bees' troubles is to foster a population of pollinators in California substantial enough to handle the bulk of the almond industry's needs. As executive director of Partners for Sustainable Pollination (PSP), Kellison is working with state legislators to improve the habitat available for honey bees and other pollinators. The PSP has also submitted a written amendment to the 2008 Farm Bill that would create various incentives for California farmers to provide fallow habitat on their land for bees and native pollinators. The issues facing bees must be taken seriously, Labesque says. "If we lose our pollinators, we'll lose our ecosystems. The entire environment functions because we have pollinators. Without them, we'll lose most of our food supply. Ground cover will decrease, erosion will increase, plants everywhere will vanish. Pollinators have made everything around us happen. Without them there would be nothing." For Keller, beekeeping borders on a personal responsibility. 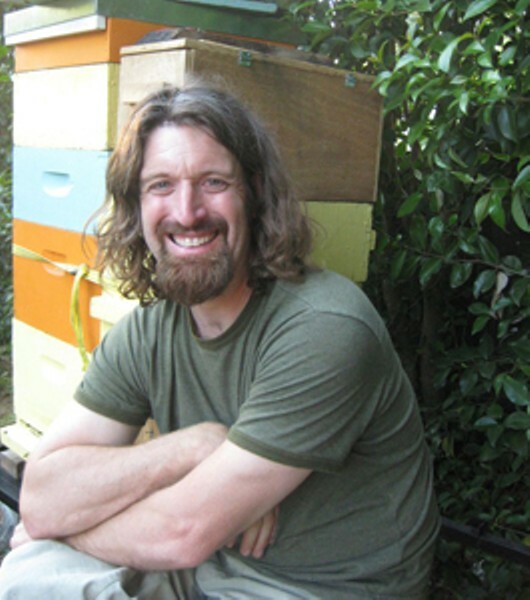 While he negotiates on cordial terms with city officials for the right to bring his bees back to town, he encourages others to take a beekeeping class, invest in the basic equipment and, he smiles, "go guerrilla." "Drastic times call for drastic measures," Keller says. "This is the right thing to do. You can't go to the city and ask, 'Can I please keep bees within the city limit?' They'll say no.